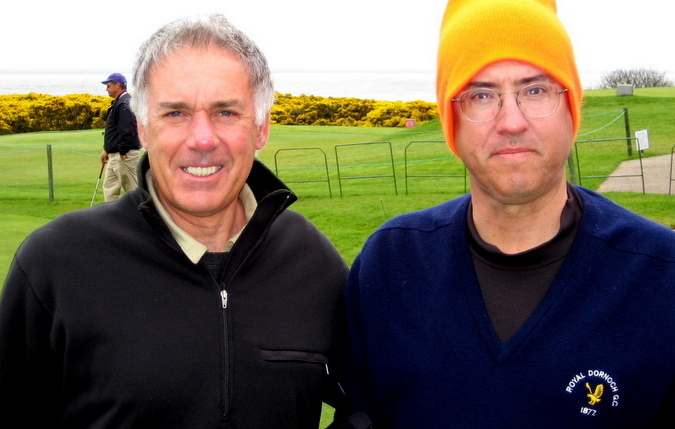 Tony and D.O., Royal Aberdeen Golf Club, Scotland, May, 2008. Tony, who is a member of my Sunday Morning Group, lives in Atlanta for almost half the year. His golf buddies there are smarter, richer, and better-looking than his S.M.G. friends, and they hit the ball farther and have better short games. I’ve met several of them, though, and they’re not as bad as that makes them sound. They haven’t invented as many golf games as we have, but they do occasionally come up with something interesting, including a best-ball game that Tony told us about recently (by email, since he’s still down there). We played it Saturday, and decided to name it after him. To play T-Bone (as we call both him and it), you need a group that’s evenly divisible into threesomes, foursomes, or fivesomes. 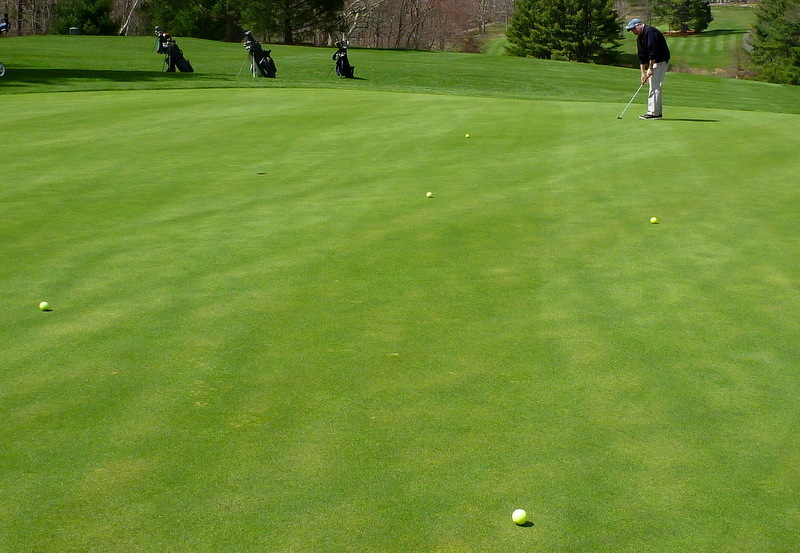 Each group counts one best ball on the first six holes, two on the second, and three on the third. On Saturday, we had ten guys. We were going to pick two teams randomly, by pulling balls out of my hat, but once the balls were in the hat I noticed that there were five white ones and five yellow ones, so we just went by color. I was on the yellow team, and if you know anything about yellow balls you know that, technically, we had an overwhelming advantage. Somehow, though, we lost by six shots. 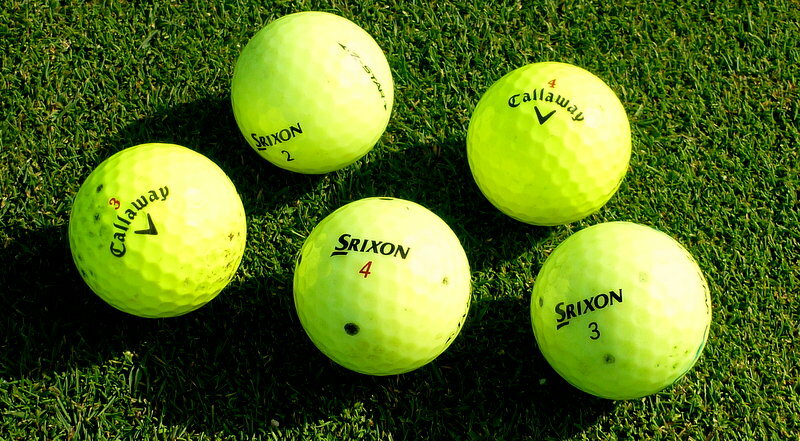 Five yellow balls plus Hacker (real name), eighth green. Even when you have five guys on your team, counting three balls puts serious pressure on slicers, hookers, shankers, yippers, dubbers, flubbers, and choppers—in other words, on pretty much everyone. In an earlier test round, on Thursday, we tried T-Bone with two threesomes, and the trailing group came very close to making up a ten-shot deficit on the final six holes. There was quite a lot of pressure, too, because by that point we were all playing together, as a sixsome, on account of being stuck behind a slow group. On Sunday, we played what might be thought of as modified T-Bone. We had eighteen guys, so we divided into six threesomes. 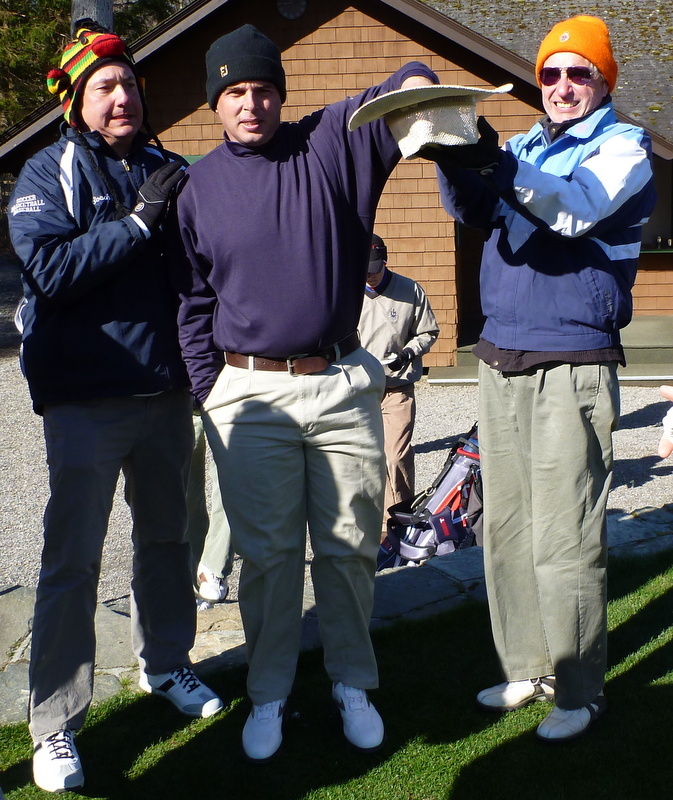 The Committee realized that counting all three balls for the final third of the round would be too brutal and time-consuming, especially early in the season, so we decided to count two best balls on the first seventeen holes and all three on the eighteenth, which was also the Money Hole. That was brutal enough. The guy in the middle is Corey, our pro. We’ve decided to call him a plus-2. Everybody gets excited when Corey plays, because we feel like we’re getting extra shots, but the advantage is an illusion because Corey, unlike the rest of us, can reliably play to his handicap, even when we have the kind of cold, windy weather that made Tony buy a place in Atlanta, as we did on Sunday. It was a good day, though, as always. My team came in not-last, and Schoonie (whose hat Corey has his hand in in the photo above) brought lunch (although he forgot cheese for the cheeseburgers). 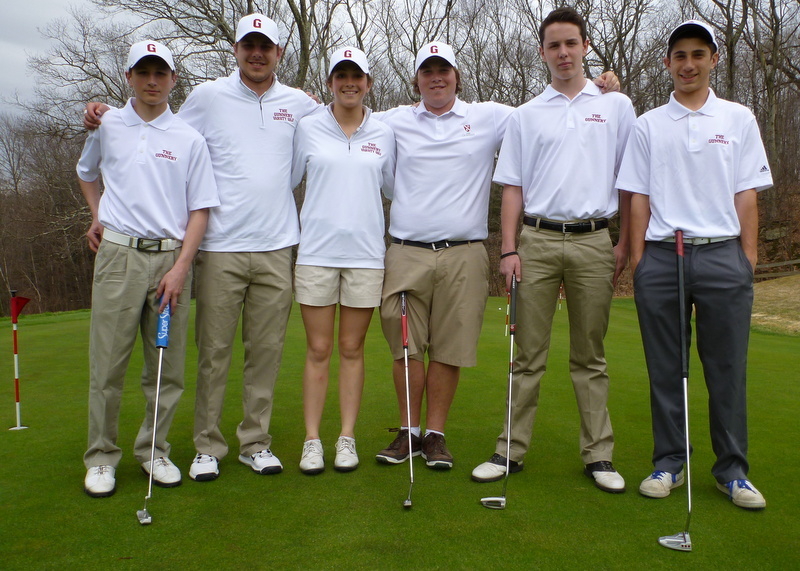 When we tried T-Bone for the first time, on Thursday, we shared the course with a nine-hole high-school tri-match. One of the teams was the boys’ varsity team from a boarding school in our town. The No. 2 player on that team is a girl (see photo below). She doesn’t hit the ball as far as Corey or Tony’s Atlanta friends, but she does hit it farther than any of us. They won, of course. This entry was posted in Games, Hacker (real name), Sunday Morning Group, Weather by David Owen. Bookmark the permalink. When my group plays that game we call it “Crescendo”….I’ve also heard it called “Tightening the Screws”. Tightening the screws is exactly what it does. We call it Hal’s goofy game, and we count 1 ball on holes 1-3, 2 balls on holes 4-12, 3 balls on holes 13-17, and all 4 balls on 18!!!! PS Ask Tony how he did in the Georgia State Super Senior. He doesn’t look like a Super Senior to me! That photo was taken five years ago. Tony looks much, much older now. And we will play T-Bone your way from now on. Or maybe we should call it H-Bone.